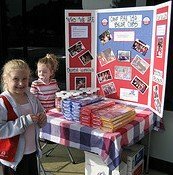 Fundraising Tips can help to make your candy bar fundraiser a lot of fun and a great way to raise money. If you are not well organized, fund raising can become more of a burden than a joy. I hope the following tips and ideas will be a help to you in keeping your campaign on track. Choose a campaign that is right for your organization. There are a variety of companies from which to choose. One of my favorites is Fast Track Fundraising. You can pick from a selection of different flavors of chocolate candy bars. Some bars sell for $1 each while others sell for $2 each. Consider your market and determine which type of bar would be easier to sell. How much money do you need to raise? Determine this ahead of time so that you know what you are aiming for. Example: You need a specific amount of money ($3000) for a specific purpose (new computers). Having a precise goal for which to aim will help generate excitement before, during, and after your candy fundraiser operation. Decide on what date the fund raising drive will begin and what day it will end. It is usually best to keep your fund raising drive fairly short. If you go longer than a couple of weeks, excitement tends to wear off. The person you select should also have some general organizational abilities and motivation skills. Determine how many group members will be participating in your fund raising drive. Calculate the average amount needed to be sold by each person in order to meet the fund raising goal. Decide where you will target your sales. You may want to begin with family, friends, neighbors, and workmates. Many people are willing to help out for a good cause, especially when chocolate is involved! Local corner stores and even some large offices may be willing to place a box of fundraising candy on their counter for a week or two. You can often get permission from grocery or department stores to stand out front and offer the opportunity to purchase candy bars to customers as they enter or exit. Of course, you would want to be sure not to obstruct the traffic flow in any way. On the weekend, visit local flea markets, sports events, or other activities where a lot people will be passing through in a short period of time. These venues make great fishing holes. Another successful way to make sales is to encourage the group members to go door-to-door in a particular neighborhood. Be sure to look at the additional tips and warnings for candy bar fundraising. Get the participants involved ahead of time by making posters that promote your cause. These will come in handy if you incorporate selling at a public venue into your strategy. In some cases, the desired goal may be motivation enough to keep your group excited and determined to actively sell as much as possible. On the other hand, a bit of incentive may be just the thing you need to boost productivity. A special award to the person who sells the most throughout the campaign. An award to everyone who sells a particular amount. If you can’t bear the expense of individual awards, create cost-free prizes. The top five sellers get to throw pie in the face of the group leader, etc. It is very important to keep clear and accurate records of all of your candy fundraising activities. Several companies provide clear record keeping sheets to help you stay organized. Every member should keep a record sheet with his or her supply of candy bars. Write down each sale immediately to avoid forgetting and coming up short. Keep your chocolate candy in a cool, dry place. Remember that it will melt if you leave it in the car. You don't want to refrigerate it either. The quality will be maintained if you always keep it at room temperature. Before you hand out a second batch of candy to a seller, collect the money from the first lot. You don’t have to act like you don’t trust someone if you establish this from the beginning as a rule set in stone. Don't allow young people to go out on a fund raising excursion on their own. As mom always said, "There’s safety in numbers." If going door-to-door, the rule is never go in someone’s home. When I was a kid, this wasn’t so dangerous, but we live in different times. Another mom adage is, "It’s better to be safe than sorry." "Hi! My name is Angie, and our church is raising money for a new Sunday School bus. Would you like to buy a delicious chocolate bar for only $2?" Be enthusiastic and have a lot of fun! A candy bar fundraiser is a great way to raise money for almost any cause. It is good experience for young people as they learn how to interact and deal with others.